Let Miss Conception take you on a hilarious, musical journey around the world as only she can! 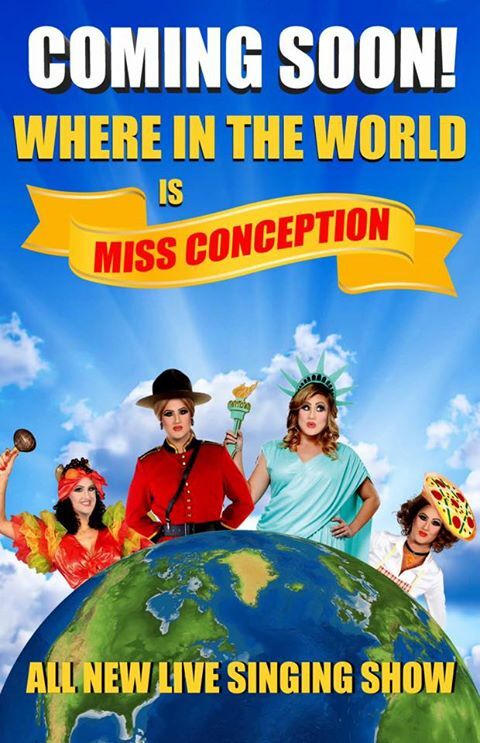 Luna Lounge is delighted to welcome Miss Conception back to Bucerias with her brand new show - Where In The World Is Miss Conception!! Miss Conception, (a.k.a. Kevin Levesque) has been performing her unique shows throughout Canada, the USA, Europe and Mexico for many years now and is delighted to be back in Bucerias where her shows are loved by so many. This year, her new show will take you on a journey around the world with classic music and song, and hilarious comedy that will leave you begging for more! Miss Conception will have you singing and dancing in your seats and keep you laughing with her incredible sense of comedy throughout the show! Those who have seen her shows before will definitely be back for more... and if you haven't.... then this is your time!